Many customers have heard that natural stone countertops are difficult to clean and require constant sealing and resealing. It's just not true. The Hospitality Institute of American has repeatedly tested and demonstrated even unsealed granite is one of the easiest to clean countertop surfaces available today. The Marble Institute of America (MIA) observed, "If a homeowner cleans their countertops after each meal, they will rarely have staining or cleanability issues with granite" (http://www.marble-institute.com/consumers/sealing-stone/). Does this mean granite countertops don't need to be sealed? No. There are definite benefits to sealing natural stone countertops, especially light colored and porous stones. We have performed our own tests by creating stains using common foods, condiments and beverages on sealed and unsealed granite. 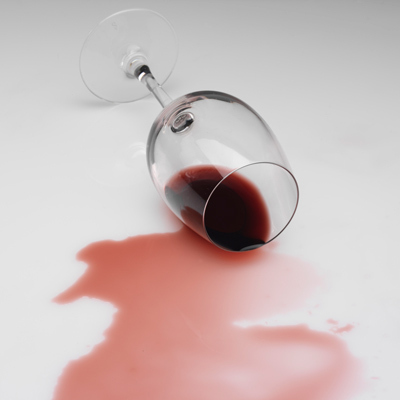 Sealed granite outperforms unsealed stone when spills are left unattended for 24 hours. What is a sealer? A countertop sealer is a product used to make cleanup easier and protect stone surfaces from stains caused by food borne particles and liquids. There are two types of sealers, topical and penetrating. Topical sealers are coatings that bond to the surface of the stone forming an impermeable, protective film on the surface. The film prevents either liquid or vapor from passing into and through the stone. Topical coatings should never be used on natural stone countertops. If the pores in stone are completely blocked the stone will not "breath” trapping water vapor in the countertop. Depending on the type of stone this can result in iron oxidation, the appearance of rust colored stains on the surface of the stone or efflorescence, the residue of soluble salts both of which can affect the appearance and integrity of the stone. Vapor trapped in the stone eventually causes topical coatings to crack, flake and fail. Penetrating sealers are comprised of a solution and microscopic solids held in suspension. Most fabricators use water-borne sealers because of their low VOC (volatile organic compounds) content and ease of application. Think of solids as tiny shields. As the liquid is absorbed into the surface of the stone the solids are distributed across the surface. As the liquid evaporates the solids are left behind adhering to the microscopic nooks and crevices in the stone’s surface. They do this without blocking the stone’s pores and once cured keep food borne particles from adhering to the countertop. Sealing your countertops will not make them waterproof. There is a misconception that water rings will not appear in a properly sealed countertop. The fact is there are certain granite varieties so dense that even unsealed they won’t darken if water is spilled on them. On the other hand there are light colored stones that will darken when water is splashed on their surface regardless of how well they’re sealed. The important thing to remember is that once the water evaporates the stone returns to its normal color. While sealing your countertops does make them more difficult to stain and easier to clean it doesn't eliminate the need to cleanup up spills promptly. According to Brooke Bartlett, a senior consumer relations specialist with Stone Care International, even when countertops have been fully sealed, "Items like hot butter and hot oil can cause staining... especially around cooktops." It just make sense to be prepared from prompt cleanups. In 1993 Solid Surface Designs, Inc., began business as a factory certified fabricator-installer for DuPont Corian. Since then we have grown to become the region's largest fabricator and installer of Granite, Quartz and Solid Surface countertops. If you have any questions about countertop design and installation give us a call at (417) 258-2780 or email your questions to keith@ssdionline.com.